Soundtrack Saturday Rewind: "Pretty in Pink"
Soundtrack Saturday fans rejoice! Kelly Stitzel is reposting some of the most popular, most requested Soundtrack Saturday columns as a gift to you this holiday season. First up, John Hughes’s classic Pretty in Pink. What’s up, guys? Bet you were surprised to see a Soundtrack Saturday post pop up today, weren’t you? Several months ago, I decided to put this column on an indefinite hiatus, but you, my faithful and lovely readers, won’t let go. So, as a gift to you this holiday season, I’m reposting some of the most popular, most requested Soundtrack Saturday posts during the month of December. You’re welcome. 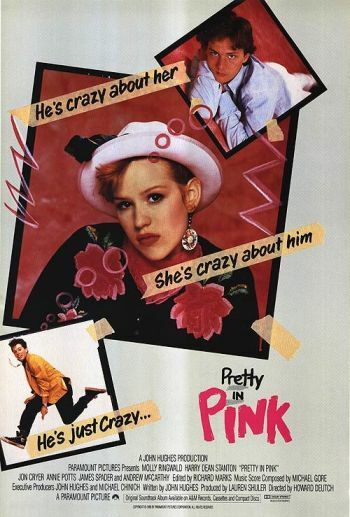 For the first resurrected post, I decided to revisit my piece on Pretty in Pink, first published on June 20, 2009. I have gotten so many requests from people to re-up or send them the tracks — probably moreso than any other Soundtrack Saturday post. So, here you go. Enjoy! I’m going to guess most of you have seen Pretty in Pink (1986), but if you haven’t, I’m sure you have a good reason — like being totally lame. Of all the movies John Hughes wrote, produced, and/or directed, this one just might be my favorite. I had wanted to see it in the theater when it was first released, but I was only eight, so that never happened. I did, however, get to watch it many times on video and cable and could probably recite every line of dialogue by the time I was 12. Written by Hughes and directed by Howard Deutch — who also directed Hughes’s Some Kind of Wonderful (1987) and The Great Outdoors (1988) — Pretty in Pink is the story of Andie Walsh (Molly Ringwald), a high school senior “from the wrong side of the tracks” with a new-wave fashion sense, an unemployed father, and a best friend, Duckie Dale (Jon Cryer), who’s madly in love with her. Rich preppy Blane (Andrew McCarthy) makes a visit one day to Trax, the record store where Andie works, and the two do some serious flirting. After a few more flirtatious encounters there and at school, he finally asks her out. The two attempt to start a romance but encounter judgment and resistance from their friends, including Blane’s best friend, Steff (James Spader), who secretly likes Andie; Steff’s girlfriend, Benny (Kate Vernon); and Duckie. Every time I watched Pretty in Pink as a kid, I wanted to be Andie. I loved her clothes, I loved the fact that she worked in a record store and had such a fun boss in Iona (played by the wonderful Annie Potts), and I loved that she had all these cute boys after her, despite not being the preppy, blonde, popular girl. For girls like me, who weren’t the most beautiful or popular people in school, Andie was the type of character we gravitated toward, and Molly Ringwald was the perfect actress to play her. Here’s some interesting trivia I discovered while writing this post: Did you know that actress Alexa Kenin, who played Andie’s best friend, Jena, died shortly after Pretty in Pink finished filming? I couldn’t find anything about how she died, but if you watch the end credits, the film is dedicated to her and set director Bruce Weintraub, who passed away not long after she did. I managed to cobble together the entire soundtrack, minus two songs I couldn’t find: “What’s It Going to Be” by Maggie Lee and “Pursuit” by Winston Sharples. I even threw in some bonuses for you just because I’m nice. Please to enjoy.